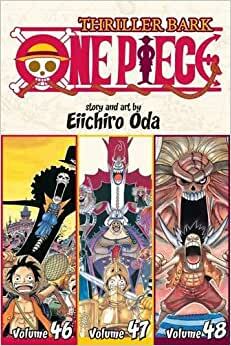 A mysterious floating treasure tempts Luffy and his Straw Hat crew into the treacherous waters of the Florian Triangle. Before they know it, they’ve sailed into the maw of Thriller Bark, an extremely creepy zone populated by ghouls and ghosts and an awful lot of zombies. Soon the crew has lost their shadows to a very nasty enemy—Gecko Moria, one of the seven warlords of the sea. Will Moria make zombies of the Straw Hat crew?! One Piece is such a heart warming, memorable series with so much action. This set of volumes just adds more to the on going beautiful story of Luffy and his friends!